In 2013, LGBT History Month launched their second Cultural Commission programme, supported by Creative Scotland. I’d gotten to know one of the previous recipients, Lucy Holmes-Elliott, through I AM ART, the visual arts programme I ran through my charity, Cosmic Designs, and she encouraged me to apply when it opened. The I AM ART project was working with young LGBT people on exploring the theme of identity through art, and we worked with a group of participants who totally excelled through the project, many of them embarking on artistic careers after it was finished, their creative juices flowing after exhibiting their own brand new work during the Glasgay! Festival of that year. I enjoyed the I AM ART project, although it was difficult to engage with young people who wanted to explore LGBT themes through art. There are many reasons for this – some folk just aren’t artistically minded, there hasn’t really been a history of participative visual community art projects within the LGBT community in Glasgow (although that’s quickly changing) and, I think importantly, there isn’t a huge amount of out LGBT artists who can inspire young folk to get into it. While I spent the year managing the project, I was aware that my community arts work was also taking up time I could, and perhaps should, be spending on my own practice. So the Cultural Commission was a really inviting proposal. Receiving funding to spend a year working on a new piece of art that was intrinsically connected to the LGBT community felt like the ideal next step for my career. As a comic book creator of around 6 years, it was tempting to put forward a proposal to do an anthology comic, or to create a comic of my own, but I felt that if was afforded the money, and with it the time, to spend a year exploring my practice, I would be better trying to push myself to try something new. I decided to propose an animation based on interviews with community members across Scotland. 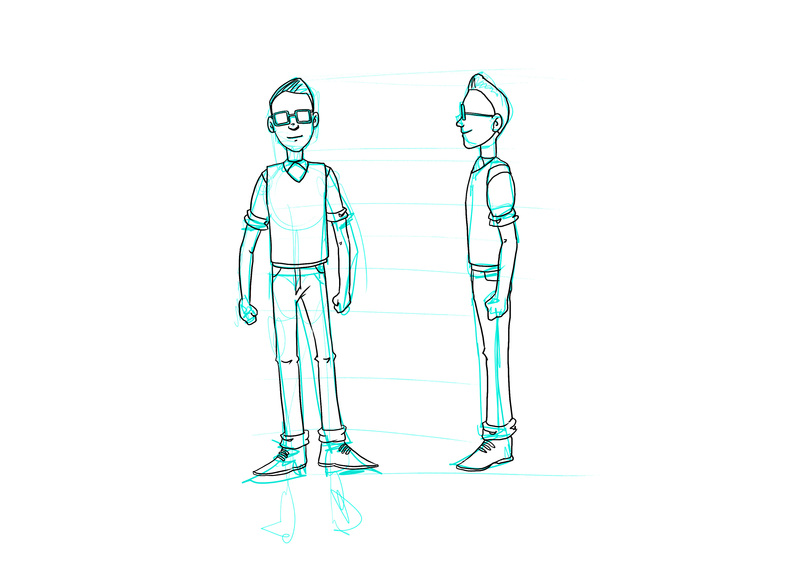 I’ve long had a love for animation, but only a very basic experience of making them. The community interaction was important as it felt like bridging a gap between my own community work and my personal practice. I was overjoyed to be awarded the funding, and embarked on a journey where I met many people who shared their stories with me, learned frame by frame hand drawn animation techniques and software from scratch, and discovered a lot about myself and my relationship with not only the community, but also my own sense of identity. I’ll post more specifically about that journey soon, as it’s deserving of a post of its own. But for now, I want to concentrate on what the Commission meant to me as a queer artist. Freelancing in art is a difficult career. Most of your skills development and practice has to take place in your own time, which means that any paid work you do not only has to fund your living costs, but also your time. That time is used to literally practice, to draw, or paint, or write, or whatever, over and over again to get better. To learn things like perspective, anatomy, architecture, composition, colour theory etc. Clients usually aren’t paying for any of that – they’re paying for a specific finished piece of work, and they genuinely aren’t interested in how you got your skills to the level they want, they just want the product. On top of that, you’re also running your own business, buying new equipment, keeping accounts, regularly going to meetings to develop your business. Most of that comes out of a fairly meagre wage. That’s why arts funding is so important. It mitigates some of the time you need to spending getting better at art. You are, after all, judged only on the quality of work you produce, and you have to continually push yourself to be better, to excel. Creative Scotland is an important resource for that, and we’re very lucky to have it, despite obvious grumbles with the arts community. Taxpayer money and lottery funding is specifically diverted to ensuring that Scotland’s arts sector can survive, and while there are many debates around how that money is, or should, be allocated, we should be glad that it’s seen as important enough to our cultural and social existence that we have a body specifically tasked with supporting the arts. It’s equally important that some of that money is funnelled to specific areas. Until LGBT History Month Scotland’s Cultural Commission, there was no specific funding in Scotland for LGBT artists. Of course, there are many organisations and projects that work within the community and receive funding, but this is certainly the first time I’ve been aware of a funding pot specifically for artists who are either LGBT themselves, or are making work specific to the community. Contributing to the artistic life and career of LGBT artists encourages us to work within our community, to respond to it, and to our relationship with it. It takes visible artistic work to encourage new artists to come forward and use their practice to explore and raise awareness of those lives, issues and experiences that are unique to being LGBT. The Cultural Commission not only afforded me the money, and therefore the time, to go and learn a new practice, animation, it also gave me the opportunity to travel the country and speak to people who had shared experiences, whose experiences differed due to age, location etc, and whose lives are rich with the kind of detail that “LGBT” doesn’t cover as a label. That work is now part of the cultural landscape, and will be archived for history, keeping those stories alive for future generations. ‘Out There’, the anthology of LGBT writing edited by Zoe Strachan, which was the other Cultural Commission that year, does a similar job – letting the lives of people, in this case writers, speak for themselves. So what am I saying with all of this? LGBT History Month Scotland has announced this year’s Cultural Commission. There’s only one this year, and the funding pot is a bit smaller (that crucial arts funding I talked about earlier gets squeezed, every single year, unfortunately), but it’s there, that chance, that opportunity. If you’re a queer or LGBT artist based in Scotland, or if you’re an artist who has in mind a piece of work that would talk particularly to our community and history, then there’s no reason not to apply. That funding could give you the time to explore not only a new piece of work, or a new medium, but potentially yourself, and so develop your own practice and career even further. For more information, head over to the History Month website here, and feel free to get in touch with me directly if you want to ask any questions about my own experience with the commission. The work itself, a short animation now titled ‘Own Words’, was shown as the SQIFF film event at Summerhall. While the commission is now complete, I’m taking some time to sharpen up some rough edges and improve the sound quality before sending it out to film festivals. That means I can’t put it up online just yet, but it’ll be up very soon! I’ve had a busy old week, starting on two projects simultaneously. One of those is the third issue of Freak Out Squares by gentleman deviant Harry French. Coming back to comic work after a fairly long break (the last thing I did was a strip in December, then I was focussed on the animation) has been fantastic. 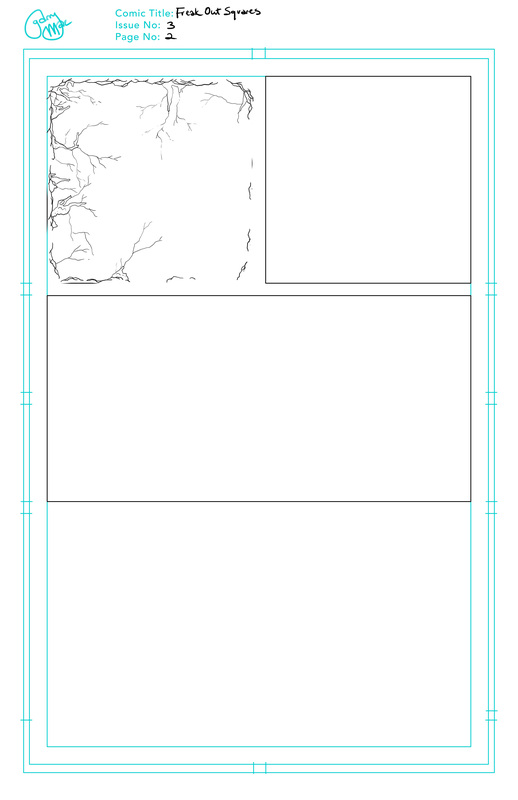 I seem to have loosened up a bit – I feel like I’ve got a style that’s working for me, and I’ve gotten much faster at producing pages thanks to a refined, all-digital approach. Harry and I are in discussion about some exciting prospects for Freak Out Squares which we’ll reveal when and if, but we’re keen to share some process and work-in-progress work with you. This issue, I’ve dropped back the spotted blacks from the last – that was an experiment, but I don’t think it worked as well as just letting my lines breathe, so I’m concentrating on detail this time around. Working in Photoshop digitally has become ideal thanks to some wonderful brushes, the Lazy Nezumi plugin (which smooths brush strokes, has ellipse guides and and and! perspective tools that make perspective in PS a total breeze now), and my increased use of things like the the Ruler tool (which I didn’t even know existed) and the grid. 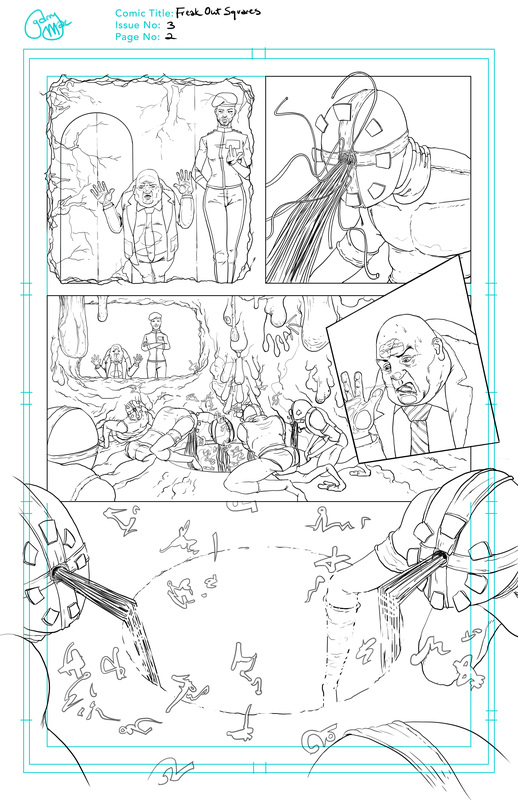 All of these things have combined to make it really intuitive and simple to go from thumbnail to layout to finished digital pencils/inks, doing perspective on the fly for each panel, setting up grids and stuff and just making everything look clean. A lot of this stuff saves a lot of time, which means I can do a lot of preparatory work without taking ages, and leaves me more time to spend on the finals. 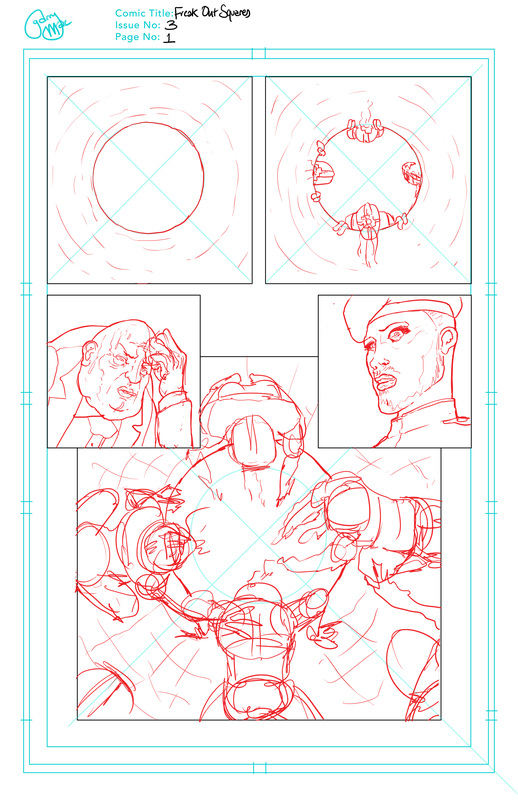 Working on page 3 just now, which is where the new sense of symmetry and asymmetry really starts coming into play – we’re pushing and pulling elements of the book against the grid, depending on the mood and narrative of the page, so being able to set up everything digitally is really helping. I should say as well that this is the first book I’ve ever sat and thumbnailed sitting with the writer. 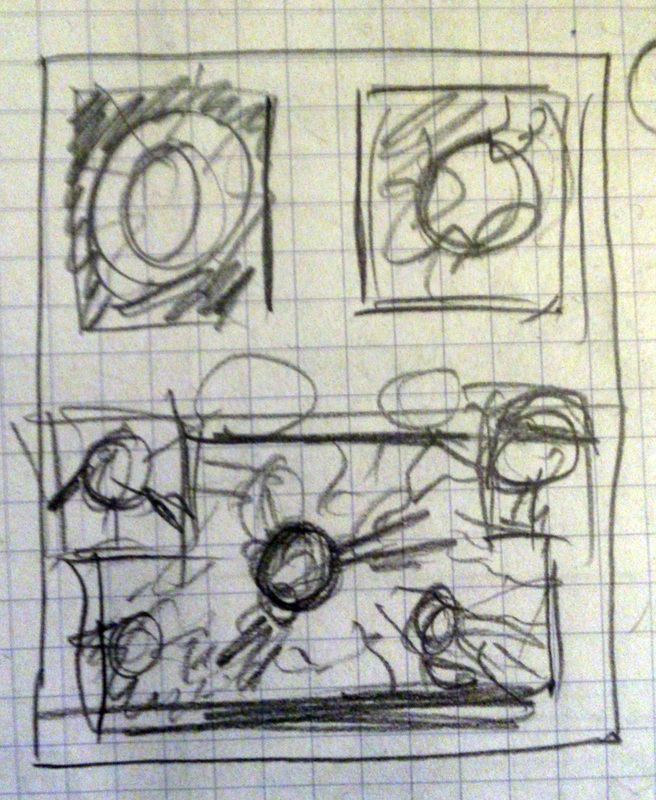 Me and Harry had two sessions of sitting going over the script while I thumbnailed, and it was really worthwhile. For Harry, it’s given him an idea of how I think visually, which is something writers can always benefit from – it can go into the scripts from the off. And for me, it was great sitting with Harry, bouncing ideas for panel placements off him, knowing we could alter the script structure without me having to try and explain it by email and waiting for the yay or nay. I’d urge anyone who has the opportunity location-wise (or even through Skype) and the inclination to work this work to try it. 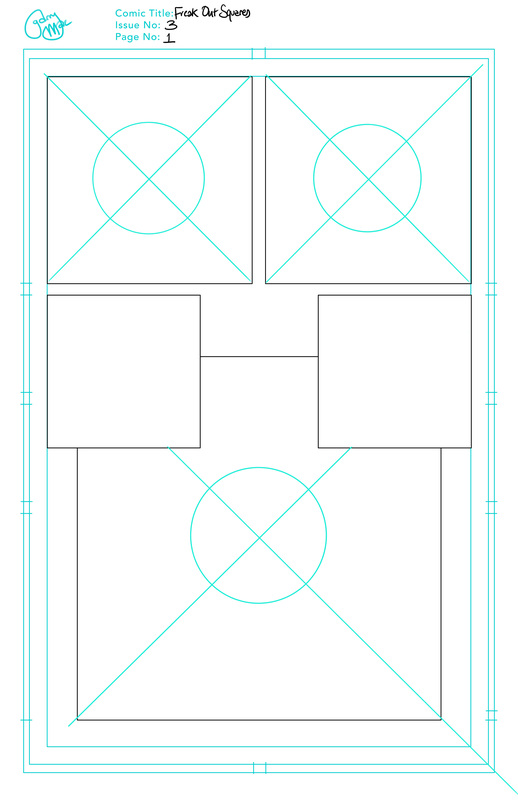 While I wouldn’t expect much of my other work to follow this pattern, it’s good to do it at least once. Makes for more confident pages, I think. 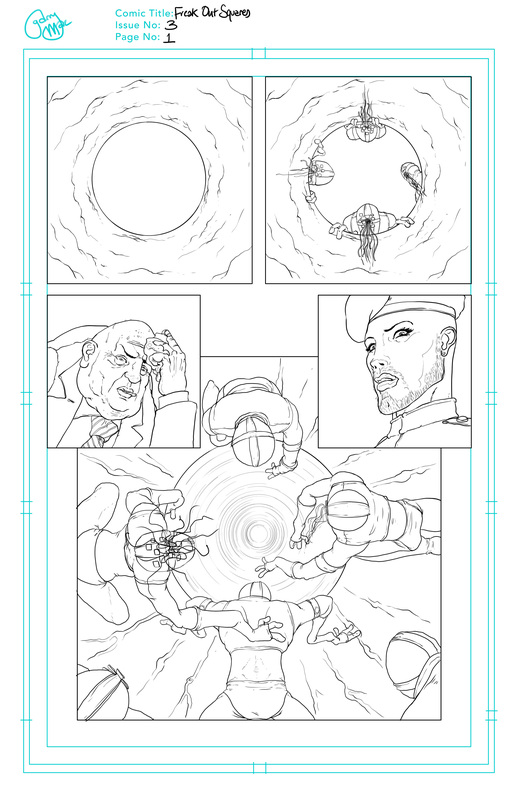 Anyway, FoS 3 will be out soon, looking to have the art completed by early April, and then colours (by the brilliant Harry Saxon) and letters (by ‘Gentleman of Comics’ Colin Bell) so shortly thereafter. It’s going to be brilliant, so keep your eyes peeled. Also, it transpires that Photoshop is a fantastic tool for animating too. Who knew? It takes a while to get over the slightly non-intuitive use of the Timeline, but for hand drawn animation, it’s fantastic. Aiming to get a short tutorial up online soon so you can all see how great it is! So, the SQIFF event at Summerhall on Saturday was fantastic, the films were amazing, and it was a great crowd. That’s the commission complete, although I want to work more on the animation in my spare time to polish up the visuals and the sound. I’ll get it up online soon, but for now I’m taking a break. Well, a break from deadline work, I’ll still be writing and drawing for my own pleasure… So glad to have been accepted for this commission, it’s been an amazing opportunity to have the time to stretch myself out into a new set of skills, and I think I’ve got the animation bug now.